Layout: - forward is a chain locker with storage, a V-berth and drop down table. Galley: on the port side there is a small galley area with a two gas ring burner and grill. Starboard side there is further seating and a drop down chart table. Heads: a sea toilet is fitted in a compartment on the portside of the vessel. Wheelhouse/Cockpit: open cockpit with access to the engines, with helm seat and controls, seats fitted to across the stern. New cockpit cover May 2010. Instruments: Includes, VHF, compass, depth sounder and wind direction and speed instruments, windscreen wiper, Navigation lights. Deck equipment: Peking is fitted with manual winches, blocks, tracks and sails. 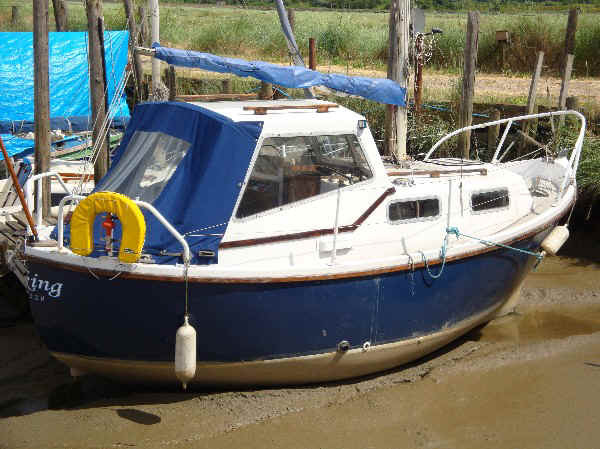 She also has a anchor and chain with a manual anchor winch fitted. Peking has carpet fitted in the cabin and is fitted out in Mahogany faced ply.